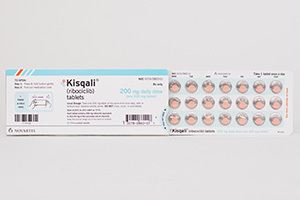 KISQALI® (ribociclib) is a solid dose prescription medicine used in combination with an aromatase inhibitor to treat pre/perimenopausal or postmenopausal women with hormone receptor (HR)-positive, human epidermal growth factor receptor 2 (HER2)-negative breast cancer that has spread to other parts of the body (metastatic). Kisqali requires 3 pills a day to be taken at the same time, each day for 3 weeks and patient adherence to this regimen is extremely important. Lilly’s Verzenio (abemaciclib) is another solid dose drug approved for hormone receptor-positive, HER2-negative metastatic breast cancer. It requires the patient to take a morning and an evening dose. Both packages build on WestRock’s legacy of designing medication packaging that’s proven to enhance adherence. WestRock’s enhanced adherence packaging is shown to achieve an 80% PDC with up to 37% more patients versus standard vials. Submitted by PCI Pharma Services on behalf of Synergy Pharmaceuticals Inc., Trulance® (plecanatide) is a once-daily tablet approved in the U.S. for the treatment of adults with chronic idiopathic constipation (CIC) and irritable bowel syndrome with constipation (IBS-C). Trulance is the only prescription medication for CIC and IBS-C available in a unique calendar pack that is patient preferred to a traditional pill bottle. The calendar pack is designed to help make it easy for patients to remember to take their medication. 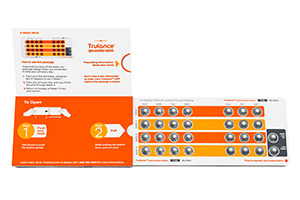 Trulance tablets are organized for each day of the week to ensure patients never miss a dose and the last two tablets of the 30-day pack are displayed with a reminder to refill the prescription. The Trulance package also utilizes the patented WestRock Dosepak which has proven to increase adherence, enabling and empowering patients to comply with complex regimens and ultimately driving refills. 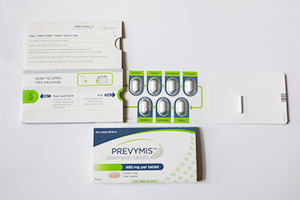 PREVYMIS is a prescription medicine to help to prevent cytomegalovirus (CMV) infection and disease in adults who have received an allogeneic hematopoietic stem cell (bone marrow) transplant. The PREVYMIS calendared blister wallet for the US market was designed to provide a comprehensive approach to initializing therapy utilizing a compliance promoting design. This custom design utilizing WestRock’s Dosepak platform technology, integrates visual cues such as arrows to help guide each patient through daily dosing; encouraging compliance while keeping the dosing regimen simple to understand. The opening instructions are clearly illustrated with prominent text and differentiating colors. The wallet provides ample space for medication information and dosing instructions in a very clear format to help patients. Branding and product description can be seen on the outer packaging and the package insert is contained within the 5th/6th panel. One tablet must be taken daily and each wallet provides one week of therapy. 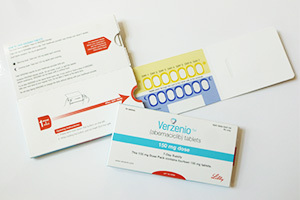 Each blister cavity is individualized with the corresponding day of the week, permitting patients to start treatment any given day and indicating when they will finish the pack. Removing a tablet from the wallet provides visible evidence medication was taken that day. Additionally, it helps provide patients with a sense of accomplishment as they progress through the therapy and ensure the prevention of CMV. The pack is both senior friendly and child resistant achieving an F=1 rating, as required for the US market. The blister cavities protect the product from moisture, oxygen and light. The HCPC will present the awards for the 2017 and the upcoming 2018 Compliance Package of the Year awards at their March 2019 HCPC members meeting when the organization will host the IoPP Drug and Pharmaceutical Packaging Committee in Charleston, SC.